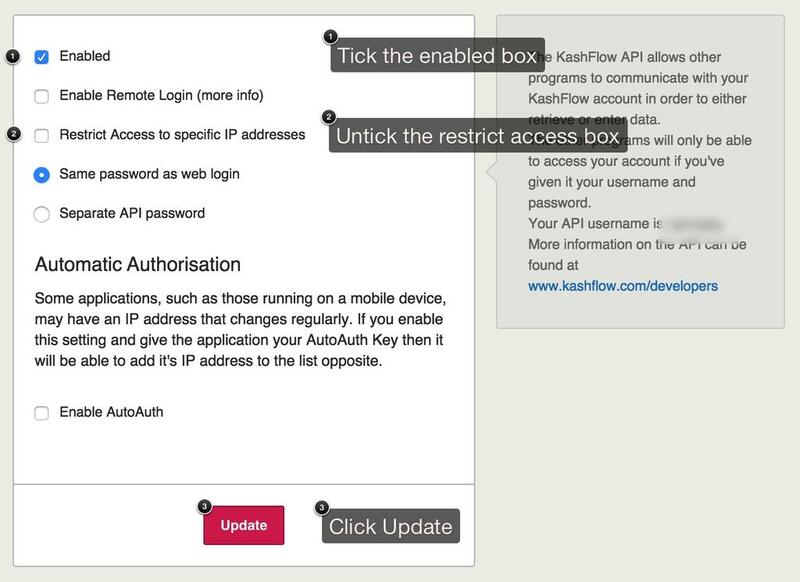 The API allows KashFlow and a third party program to talk to each other and exchange data. You’ll need to enable the API if you want to use any of our apps, integrations or the iPhone app. For most applications using the API you will simply need to tick the box for Enable API and un-tick the Restrict Access box. Remote Login – this feature lets the application provide you with a link so as to seamlessly direct you to pages within KashFlow without having to ask you to log in again. The API must also be enabled. Restrict Access – these options let us restrict access to your account via the API to certain IP addresses. If you don’t know the applications IP address leave this option unticked. Same Password as web login – opt for this to use your standard KashFlow username and password. Separate API password – If this option is selected, this means that third party applications and add ons will need to use this password, rather than your main KashFlow password. Note: You will also need to use this password to access the CSV Importer. When you’ve made your changes just click the Update button.